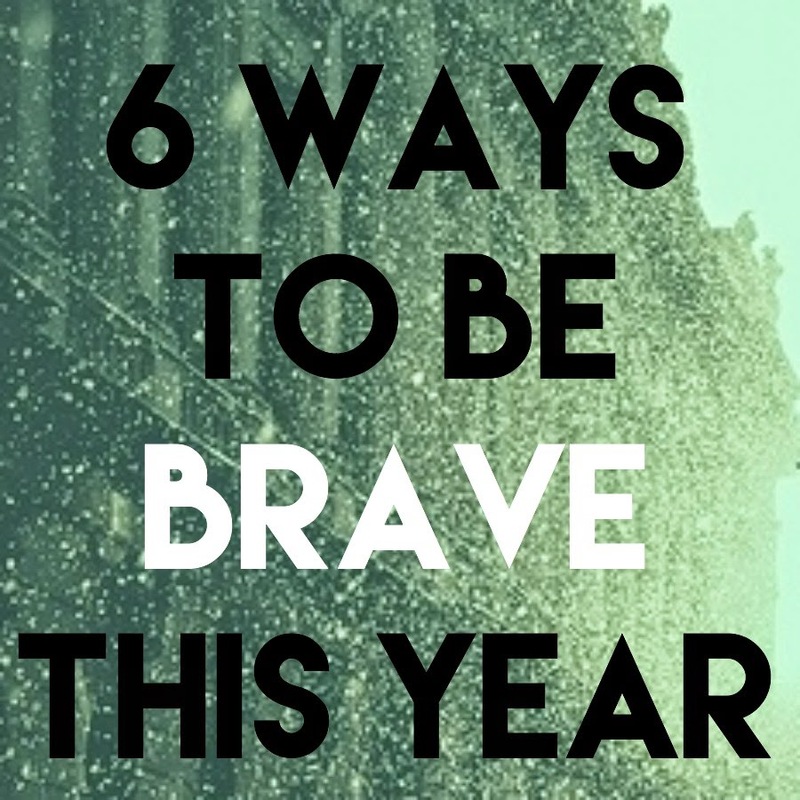 6 Ways to be Brave This Year. | The girl who loved to write about life. By nature, I'm not a very brave person in all areas of my life. I hover somewhere between being a firecracker who wants to live life out loud and having crippling anxiety over the thought of confrontation. In 2014, my word for the year was brave. All year long, I worked on living life more bravely. And it was fantastic. 1. Say yes to something new once a week. I've heard the saying, "Say yes to something that scares you once a day." But that just seems a little excessive to me. You don't have to constantly be throwing things you're afraid of in your face to be brave. Just try new things--order something new at your favorite restaurant or do something new to your hair or read something you normally wouldn't. Say yes to new things. 2. Plan out your dream. Sometimes, you know what you're dream is. But you're afraid to make a plan to follow it, much less tell someone about it, because you don't know if you'll succeed or not. But who cares? You definitely won't succeed if you don't ever start, so start. Make a plan. Make a plan that includes your biggest, wildest dreams. Write it down, talk about it, and follow it. 3. Go somewhere new. A new coffee shop, a new city, a new country...just explore. 4. Say what you want out loud. Saying what you want doesn't make you rude. 5. Learn something new. What's something you want to know how to do, but think you wouldn't be very good at? Try to learn. So what if you're not good at it? 6. Don't be afraid to disagree. This is so hard for me, because I hate confrontation. I'll make reservations somewhere and ask for a booth, and then not bring it up when they give us a table instead. Or I'll order a drink with no ice, and then just drink it when they put ice in it anyway, because I hate confronting people, no matter how small. This doesn't get any easier for me, but the more I speak up, the more confident I feel. Even if it's over something as stupid as ice. Bravery is something I'll probably have to work on for the rest of my life. I just don't want to one day look back and think that my life could have been so different had I spoken up more, or it could have been better had I not been afraid to say yes more often. So cheers to bravery in 2015.
love this! I really want to be more brave, i NEED to step out of my comfort zone. you are so awesome. BRAVE is such a great word for the year. I applaud you lady!!!!! I don't like confrontation, either. If someone insults a friend/family I get Mama Bear mode, but if it's just me I don't say anything. Until it becomes too much, then it's on like donkey kong ;)! Being brave is an awesome thing. I would love to challenge myself to go somewhere new...ALONE. Even a movie that I want to see, or a restaurant or coffee shop to unwind and read for a few hours. That is something I will do this year! I like the idea of saying yes to something new each week. I'm going to give it a try! Last year was my year of becoming braver. It's incredible how I've changed. You got this, bravery is awesome. Bravery is always something I've admired but never really been amazing at myself. I think I may have a problem with any kind of confrontation too. So I think this is an inspiring thing to do. I think this year I will try to be brave too. Adding more bravery to our lives is always a good thing. I didn't set it as a resolution per say but I knew in 2015 I wanted to be more focused on saying yes and trying new things out much more than I have before. I love this SO much. This year I am going to be brave and write my novel, edit it, and I will get it published. I will. I love this, especially the one about saying what you want. I definitely want to work on that, I hope it will be freeing. Cheers! One of the things I love about working in a city is all the things to see and do new, all the time. Number 4 and 6 are things I really need to work on. I'm right there with you about confrontation. I'm very passive (sometimes passive aggressive) and I think it holds me back at lot. Love the idea of trying new things and learning new things! this is a great one! years ago i went through a really bad breakup and to get through it i went through what i called the Year of Yes. I constantly pull that one out still. just saying yes, being brave, to things you wouldn't normally do...it was great. Going to new places and trying new things out is so fun and 99% of time rewarding :) You got this! I love this list -- they are all great ways to be brave! I love this list. And being brave is so important to me. I have so many prints reminding me of this! Love this! You're truly inspiring! I feel like I can say that I've done or am currently doing some of the things on this list so I consider myself to be brave!! ughh i struggle with the disagree! yesterday in our office everyone was saying how much they hated coleslaw served with bbq food and they kept calling it useless. in my head, i like a little something bright to go with all the heavy savory food, it's a nice contrast. but they way they were hating on coleslaw, omg you would have thought that they were rioting in the streets. so i said nothing... but i know that i should not be afraid to say, "hey guys, not everyone hates coleslaw and that's okay"
I agree that something new every day is excessive but once a week sounds reasonable although more difficult this time of year when I don't want to do anything! I suppose it would force me to not hibernate though! Love your word! Such great advice, per usual. I'm excited to step out of my comfort zone and learn a few things this year! This is a beautiful post! I particularly relate to #6, and I enjoy your more moderate (and doable!) take on #1. Cheers to a brave year! Love this post! I'd love to go somewhere new this year. Our goal is to do a family trip each month just a little weekend getaway! Love this post! I'm right there with you on being afraid to to disagree. It's something I'm going to try to speak up about more often. This is an awesome post... and I need to implement these into my life on a daily basis! #6 - I hate confrontation as well. I avoid anything I can and it drives my husband crazy... I need to be stronger and just fact things head on. We are trying the "do something new" as much as possible this year! Tonight we tried out a new to us restaurant and it was delicious! I hate confrontation too, so I sometimes just stay quiet to avoid any arguments. I definitely need to work on this! Yes! To new places...even if is a coffee shop. Love that! This is so great. Here's to a 2015 that is full of bravery! Brave is the perfect word and you can do it. I love your list, definitely a good one! I can totally relate to this and I love the theme of brave. I've been a bit of a pushover in the past, so one of my goals is to speak up more and be more assertive. My big goal for the year is to explore! I did a lot of exploring last year and it was life changing. It's amazing how much you can grow when you step outside of your comfort zone. YES! All of this! I love it, I'm remembering it, I'm doing it.